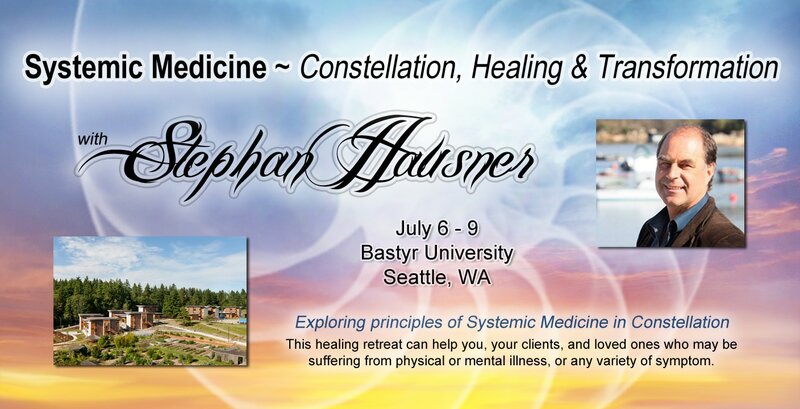 Stephan Hausner Retreat - Manifest Wellness and Abundance with Ease and Grace! Imagine a four day retreat on beautiful Lake Washington, with a world-renowned Medical Master Facilitator. and all variety of symptom, from personal to transpersonal, social to global. Stephan's warmth and open hearted presence are a balm for any soul, just as his gentle invitations to open ever further are a much needed catalyst for deeply transformative life-changing experiences. ​He is a wonderful combination of unconditional love and fierce presence. You may know Stephan by his book, Even If It Costs Me My Life: Systemic Constellations and Serious Illness. Stephan is a master Constellation facilitator, deeply informed by his previous professions as a homeopath and osteopath. Although he can constellate any issue, he has become an international specialist in working with illness. Healing for personal health issues, symptoms, or ills - personal, relational, or otherwise. ​Competence building experiences of healing connection: presence, empathy and mirroring. * Due to unforeseen circumstances, we are unable to provide CEU's as originally promised. 11:00am - 12:30pm Registration and lunch on your own. Click here to view retreat schedule PDF. ​CLICK HERE TO TAKE A VIRTUAL TOUR! Lunch is included with tuition and prepared from scratch by Bastyr University Chefs. ​Buffets include one main entree, vegetable side, salad bar, soup, dessert and beverages. Meals are made from the highest quality ingredients - and organic whenever possible. Entrees will be vegetarian and gluten-free with a variety of side options available. Grocery store in walking distance, with refrigerators and microwave available in common areas. ​Welcome Dinner Thursday evening is included if you're attending Thursday or all four days. Click here for a PDF list of off-site lodging nearby. Single - $45.00 per night Double - $35.00 per night per person. Twenty-five guest rooms are located on the fifth floor with views of beautiful grounds and the forest that surrounds the campus, rooms include two twin beds, linens, towels, a sink, closets, study area and mini-refrigerator. Shared restrooms and shower rooms are available down the hall on the same floor. There is a small kitchenette/lounge area for guests on the floor with stove, refrigerator, microwave and toaster oven, as well as an eating area. It comes stocked with plates, utensils and cookware. Complimentary Wi-Fi is available throughout the entire building, and all overnight guests have access to the 5th floor laundry room with washer, dryer, iron and ironing board, as well as a few hair dryers. For more information or to book a room contact Bastyr's Guest Services Department at 425-602-3075 or confer@bastyr.edu. Lodging at Bastyr may be booked for extended dates, before or after our retreat, for your enjoyment and convenience. Click here for a PDF about Bastyr's on-site accommodations. PLEASE NOTE: We have reached maximum capacity for this event on Friday and Saturday. If you wish to participate on Thurs (5 spots available) and/or Sun (one spot only), click the button below to sign up now! Nancy or Kirsten to be put on a wait list. Click to view: PDF Price Guide or Tuition Options Page. We've partnered together to create and hold a safe and sacred space for you at this healing retreat. These lovely folks helped get out the word about our healing retreat. We offer our gratitude to them, and we honor all the ways we support each other to grow our healing work around the world. Until May 1st, 2017 = full refund minus $50 admin fee. May 1st – June 1st, 2017 = full refund minus $75 admin fee. June 1st – July 1st, 2017 = full refund minus $100 admin fee. Partial retreat participants = full refund minus 15 % admin fee. July 1st – Start of event = full refund minus $150 admin fee.